Zapowiedź! W sprzedaży w CZERWCU. South-East Asia is one of the richest parts of the world in terms of mammals, with species new to science still being described on a regular basis. The first comprehensive guide to the mammals of this region, "A Field Guide to the Mammals of South-East Asia" covers all the mammals recorded from mainland South-East Asia, from Myanmar through Thailand, Laos, Vietnam and Cambodia and south to Malaysia. 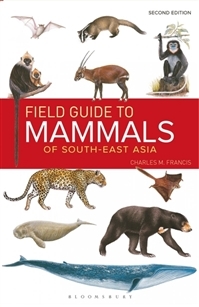 A detailed account with key identification characteristics, habitat and behaviour is included for each species, from large mammals such as big cats, the elephant, rhinoceroses and cetaceans, through bears, langurs and badgers, to bats, flying-foxes and rodents. Detailed line drawings amplify details of anatomy and other aspects. Seventy-two magnificent specially commissioned colour plates by top wildlife artists show nearly 500 major species, and thumbnail maps give information on distribution.